Once you have stiffened your decision to construct a hoop-type greenhouse (also known as a Quonset one), found the proper site for the construction, you have to ensure the structure can sustain against strong wind, heavy rain or snow, and hail, because even several minutes of exposure to them can bring irrecoverable damage to your crops. It is same disappointing regardless you have a hobby temporary greenhouse or a huge commercial one, but different cost levels. Quonset type greenhouse is considered reliable. One more key to your success herein is a deliberate approach to the selection of the covering material. You can use this online quonset greenhouse calculator to estimate the exact amount of the materials you may require before the actual purchase. By that you figure out preliminary costs. The result of the estimation is the volume and total square of the Quonset greenhouse, perimeter of the foundation, amount of the materials needed for framing and area of glazing. E – Number of vertical sections of walls. You may estimate the optimal size of the hothouse you would like by changing the number of units or sections. The parameters of units are estimated automatically. The calculations will be shown on the drawings. You may print the result. specific panels like the double polyethylene sheets, which become the best cost-effective solution for growing plants independent on the season. It is relatively a new offer, which is inexpensive at the investment stage but lasts for 2-3 years before the replacement. It is a good choice if you build a temporary greenhouse. Beside the double PE semi-rigid panels, you may calculate the quantity acrylic ones, which are already not cheap but have a long life span. polycarbonate needed for the construction of the greenhouse. It is the newest material and still under evaluation considering its duration, pros and cons. This material is both rigid and flexible, so it fits to the Quonset greenhouse structures as it can be connected to the framing, you just have to follow the assembly instructions. It may require significant investments but its long durability and high resistance to outer impacts make polycarbonate panel a desired covering material. To increase its effectiveness you may apply relevant coatings. 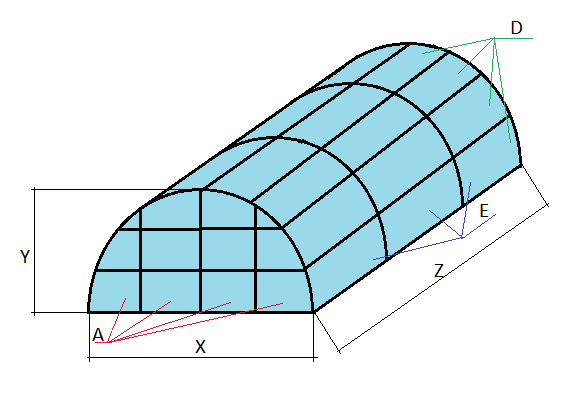 amount of glass is easy to estimate by the given app if the glass is desired, but for Quonset type of the hothouse you would better prefer another kind of the material for glazing to avoid difficulties in adjusting the glass to the framing of the hoop-type greenhouse as it results in higher costs and investments . The fiberglass is a kind of a special plastic for quonset greenhouse, which has slowly gained the popularity on the market. It is rigid, durable, and excellent in light transmission and has the best recommendations for the commercial use.